Is your roof starting to show signs of its age? If you’ve made some repairs and expect more in the near future, you may wonder at what point you should replace the roof instead of continuing to make repairs. Here are seven signs that you need a new roof. Use these signs as a guide for if you need a full roof replacement or if repairs will do the job. Your roof is over 15 years old. Asphalt shingle roofs have an expected lifespan of between 10 and 20 years, depending on the type of shingle. When your roof reaches 10-15 years old, it is time to start budgeting for a replacement. You can continue to make repairs, however, this is only a temporary fix because the roof will continue to deteriorate. If your roof is made out of a different material, such as metal or clay tile, your roof can last at least twice as long as an asphalt roof. The edges of your shingles are starting to curl. Curling is not necessarily a sign the entire roof needs to be replaced. It is a sign, though, that you may have inadequate attic ventilation. Built-up heat and moisture under the shingles can cause the edges to start to curl. If a good number of the shingles are curled, a professional roofer may recommend a full replacement. Shingles have bald spots due to granule loss. The granules on the top of the shingle are there to protect the underlying material from the elements. With a brand new roof install, you may see some granules coming off. However, if you start to see granule loss with an older roof, you likely have bald spots on the shingles. If a significant number of shingles have bald spots, it’s one of the most certain signs that you need a new roof. Shingles are cracked or broken. Asphalt shingles are tough and can withstand a lot of inclement weather. However, severe weather can cause untimely damage to asphalt shingles. Hail and flying debris can crack the shingles. Extreme heat, cold, and wind can also wear down the shingles, making them more fragile and more likely to crack. 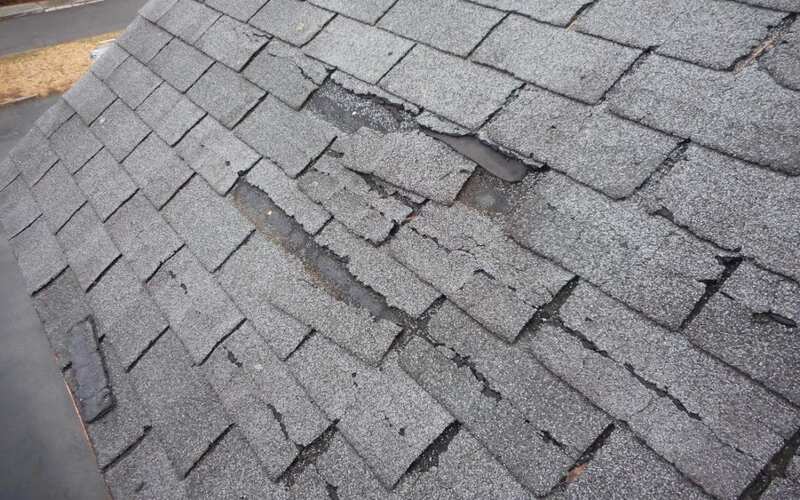 If you have a number of shingles with such damage, you may want to consider a new roof. Your neighbors have already gotten new roofs. If you live in a development where all the houses were built around the same time, you can use your neighbors’ new roofs as an indicator to follow suit. It is also a matter of keeping your home value up. When your neighbors start to upgrade their roofs, it can leave your home looking old and worn down. If you are planning on selling your home in the next few years, you may want to replace your roof first. You are seeing daylight coming into the attic through the roof deck. The only light you should have in the attic should come from a lighting fixture or through a window on the gable. Look for light coming in around the pipes or the chimney. If that is the source of the light, you might get away with a repair. However, if you see light coming through the roof deck, you definitely need a replacement. Your roof deck or ridge is sagging. When your roof deck starts to sag, it usually means there is a leak somewhere that is rotting the plywood. If the roof ridge itself is leaking, that means the roof structure is deteriorating. Either situation is among the worst signs that you need a new roof. These seven signs that you need a new roof may indicate that it is time to take action. Call a home inspector to receive a professional opinion and then you can take the next steps with confidence. Lakeland Home Inspection Service serves Central Florida with home inspection services. Contact us to schedule an appointment.